Posted 4 years ago on Friday, February 20th, 2015 by James S.
I had picked up a small Dewalt DW745 jobsite saw to split pickets lengthwise for the privacy fence I was building. I eventually started getting into woodworking and realized that the little Dewalt, while a great saw for what it is, wasn’t enough for what I wanted to do. In particular, I really wanted a much larger table and a bigger rip fence. After some Craigslist hunting, I got a fair deal on a much larger and older Delta Contractor’s saw, model 36-650. This was the right saw for me: we’re not in our last house, but it’s portable enough to move and I have plenty of space in my shop for it. It came from the factory with a cast iron top and a belt-driven 1.5hp Delta motor. I ended up using a Scotchbrite and some oil, and then some Johnson’s paste wax, to clean the very slight amount of surface rust off and protect it against further rust. It is important to use the right wax on a table saw, not because it will hurt the iron, but because it will clog the pores of wood you push across it. As stated, the saw comes with a 1.5hp Delta motor that can be converted to 240V if desired. Compared to the large 3-phase cabinet saw motors, the one in this Delta is pretty wimpy. 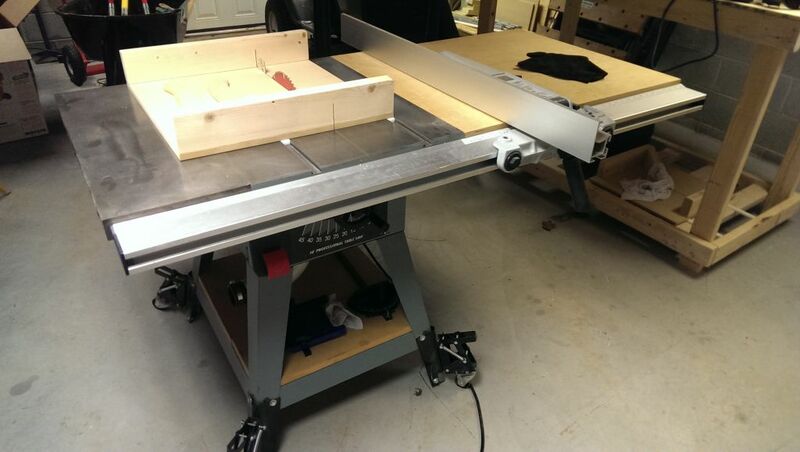 However, with a thin kerf blade, as discussed below, it has had sufficient power to cleanly cut the domestic hardwoods I’ve thrown at it so far, and also do some 1/2″ dados with an 8″ dado stack. The saw came with a Delta Unifence rip fence, which is one of the best fences on the market. One great feature about a Unifence is that I can actually slide the it so that the back of the fence is about even with the blade; this makes crosscuts using the fence much safer, since there is no fence past the cut, where the wood could bind. It looks like this is a popular upgrade for these contractor saws, and one that I would strongly recommend after spending some time with it. The table is large and cast-iron. This gives a nice, large surface to slide wood across, as well as providing enough weight to cut down on vibration and ensure smooth cutting. I believe these saws come stock with a small right-side cast-iron wing. Instead of this, mine has he pictured wood extension wing, which was was put on by the previous owner. He did a nice job, adding it as part of the Unifence upgrade. It appears to simply be baltic birch or similar plywood, and really improves the table. I was also able to turn this portion into a router table very easily. The cast iron table itself also includes two miter t-slots, which is a pretty nice feature, albeit a common one. The slots themselves can accomodate a typical 3/8″ miter accessory, but they can also handle t-slot accessories. These have slightly wider flanges at the bottom of the bar to prevent the accessory from lifting off the table. It’s not a big deal, but it ensures that you can use any typical accessory. dust collection fittings that simply screw onto the bottom of typical contractor saw stands. Sawdust still tends to collect inside the saw, so this setup isn’t exactly ideal, but it still does much better than nothing. 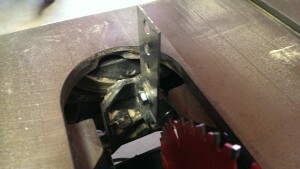 One drawback to this saw is that from the factory, it includes no riving knife or blade guard at all. It did apparently support a splitter, although I don’t know if this was included from the factory. The stock insert does have a slot for a splitter, and there is a bolt hole to mount it under the insert. It appears as though a previous owner must have chucked it, though. Unfortunately, Delta no longer stocks the part. Even if I could buy it, however, it was intended for a standard 1/8″ blade. My saw came with a nice Freud thin kerf blade. The kerf is the thickness of the cut a blade will make in a piece of wood; regular blades will chew up about 1/8″ of wood when cutting. You need to account for losing wood due to this when you’re planning out your cuts. (Zing!) Thin kerf blades have been developed in recent years as metal alloys have improved; simply put, they are a thinner blade. The advantage is that a lower-powered saw like I have, at least as compared to a 3-5hp cabinet maker’s saw, can power through wood more efficiently. However, this makes the cut too thin to use the standard Delta splitter, as the freshly cut opening in the wood would get stuck. I wanted to have something to prevent kickback, though, and I saw that the original Delta bolt hole was still in place. Like I said, the original Delta wouldn’t work with this blade, and it was quite expensive as well. I just got a piece of thin, flat zinc-plated bar from Home Depot, and cut it to length with my Dremel cutoff wheel. It was a cheap solution that works great. Eventually, I plan to make a zero-clearance insert for the saw. At that point, I will probably build a splitter into the insert itself. So far, I have found the saw to be excellent. This particular model was made years ago, when Delta was still making top-notch stuff. I have been very pleased with the results I’ve gotten from this saw and would recommend it. That said, it has a few drawbacks from the factory. Most notably, there is no riving knife or blade guard capability, so something shop-built has to be substituted. Additionally, the stock fence is reported to be very average, so the Unifence upgrade is highly recommended. Otherwise, it’s a very capable saw.